The notion of discrimination has been the plague of humanity since forever. People have been targeted and persecuted for their skin colour, religious affiliation, race, nationality and others attributes. History is full of bloody periods where men, women and children have been exposed to violent hostility and deadly means for no reason besides their unique identities which their aggressors have used as pretext for crimes and atrocities inflicted upon them. In the present days, at the time where the human civilization declares its superiority, new forms of hatred and bigotry have come to light. Modern stereotyping and what is considered to be the old fanatic stereotyping share many parallels, one of which is that both are discriminatory towards groups of people due to attributes of their identity, race, convictions and cultural background. The “new concept” of discrimination has been demonstrated under various titles, such as racial profiling, anti-Semitism and Islamophobia. In 2010, the Canadian Muslim Forum (FMC-CMF) had led a community delegation to the House of Commons in Ottawa Hill. The objective of that parliamentary day was to create awareness and shed more light to the legislators over the notion of Islamophobia and the very troubling sharp increase in reported incidents that were related to this issue. Statistics and points of discussions were presented. Concerns over the moral and physical violent incidents against Canadians because of their visible religious identity had been some of the focus points brought up during the trip to Parliament that day. As the years have passed, the Canadian Muslim Forum (FMC-CMF), community organizations, activists, human rights groups, some public figures, intellectuals, elected officials and others have kept their worries very well exposed over the intensification of Islamophobia in the country. Media statements, seminars and lectures, raising the subject matter to elected officials and creating awareness amongst the communities and the general public have all been means used to demonstrate the danger of letting hatred and intolerance prevail, which would lead to a toxic environment by bringing up friction within the society and creating fear in the hearts and minds of young Canadians who have been victims of verbal and physical aggressions by bigots and hatemongers. In early 2015, the Canadian Muslim Forum (FMC-CMF), in a press conference held in Montreal, voiced citizens’ frustrations and denunciations over using the Muslim community as a political football by certain politicians in hopes of gaining more votes during election periods. Furthermore, there were notes over the role of a few media outlets in inflaming Islamophobia during these times. As hate speech moves from being a phenomenon to a social disease, some politicians, public figures and other media outlets joined in on the warnings expressed previously that Islamophobia has to be stopped, rejected and deplored. On Oct 1, 2015, Quebec’s National Assembly came together to condemn Islamophobia. Furthermore, more declarations started to be heard from various sides, whether from the governmental ruling side or the opposition side, all joining together to warn against the looming upsurge of hate speech. The tackling of Islamophobia as a Canadian issue took another step ahead on the ladder of interest in the country. On June 8, 2016, a petition had been initiated by myself and sponsored by Frank Baylis, federal Liberal MP of Pierrefonds-DDO, calling on the House of Commons to condemn all forms of Islamophobia in Canada. The petition known by e-411 collected close to 70,000 signatures, making it the most signed online petition in the history of the House of Commons. Canadians from coast to coast showed their support for the request that the petition carried to denounce discrimination against Muslim citizens. Based on the solid support that the petition e-411 got from Canadians, a motion to condemn all forms of Islamophobia was submitted, on Oct 5, 2016, to the House of Commons for unanimous approval by all MPs. Although the unanimous motion didn’t pass through due to the refusal of a small group of Conservative representatives out of the 338 members in the House of Commons, the fact that it earned the consent of the vast majority of other legislators proves that the Islamophobia is becoming a true Canadian concern. Surely, the trip to recognize and to condemn discrimination, as it is a total contradiction to Canadian values, has not come to an end yet. Canadians from all stripes of social, political, racial and religious backgrounds are coming together at a much faster pace to stand united up to hate and smear campaigns against their fellow citizens. 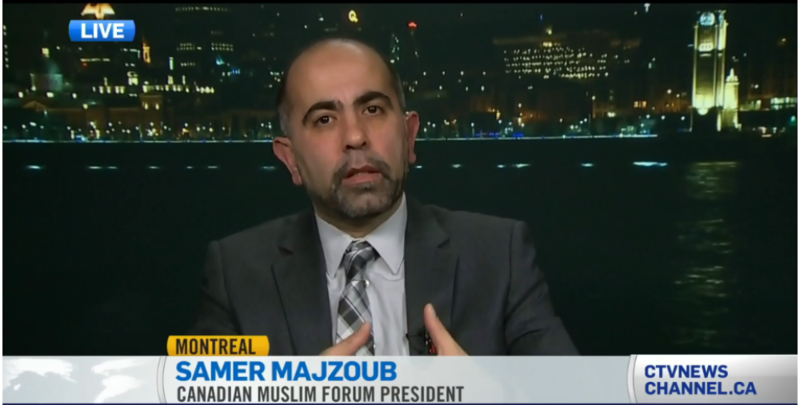 This entry was posted in article and tagged (FMC-CMF), anti-Islamophobia, Canada Muslims, Canadian Muslim Forum, Forum Musulman Canadien, Islamophobia Is Now A Canadian Concern, Islamphobia, petition e-411, Samer Majzoub by samermajzoub. Bookmark the permalink.